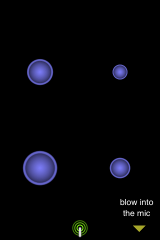 Another thing that makes this application unique is that it is also a social application. 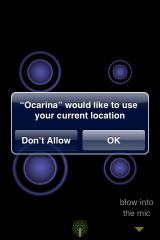 “Tap on the globe icon and you will see and hear other Ocarina players throughout the world. 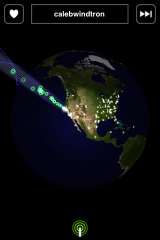 The globe view will highlight the source of the music. Rate your favorite performances so that others may benefit from your judgment. Name your Ocarina if you want listeners around the world to identify your performances.” Their website has a ton of pointers and tips…including information on how to play certain notes and scores! You can check it out HERE. I decided I had to try this application for myself. 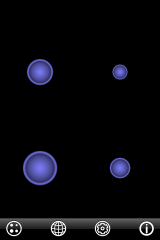 It did take a little practice to get the hang of it but, once you do…it is pretty cool. While in the application, you can bring up a lower menu bar with more options by clicking on the green icon at the bottom of the page. 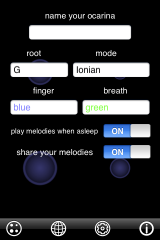 Here you will have the options to go back to the instrument, the globe option, settings and more info about the application. The Globe feature is really cool! You can listen to people as they play. You can even scroll through the people by using the arrow icon! Most definitely an application worth checking out (if you haven’t already)! 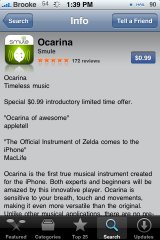 Ocarina has a 4 1/2 star rating in iTunes and has some great reviews! You will want to get it quick because the $0.99 price is just an introductory price for a limited time. Also, check out the video and screenshots below! 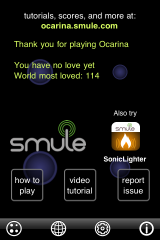 Click here to watch “Ocarina” on your iPhone or iPod Touch. 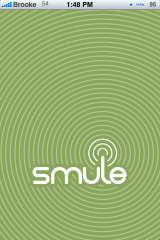 This app is so so so so cool, I downloaded it yesterday and using the Smule website have already mastered Amazing Grace! It’s apps like this which prove the iphone to be an amazing piece of technology!